The presidency last night said that there was evidence that the nation’s apex bank, the Central Bank of Nigeria (CBN), got specific instruction to ensure billions were moved from the bank directly to the residence of former president Goodluck Jonathan. 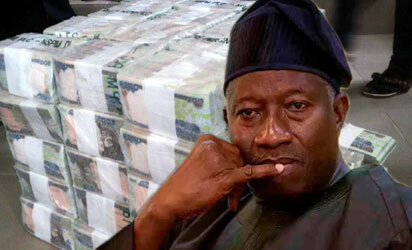 A source in the presidency said more compelling details have been established showing how several tranches of funds were illegally removed from Nigerians money by the Jonathan’s administration specifically ahead of the 2015 presidential elections. the former National Security Adviser, NSA personally supervised the physical transfer of the money from the CBN vaults to the private residence of the former President. According to the source, “In one particular instance over N70 billion was released in parts from the national treasury between January 8 and February 25, 2015. The over $289M which was also referenced last week by the Vice President is said to be included in this particular series of illegal transactions. A presidency source specifically claimed that the sum which was okayed by the CBN board was not tied to any project or procurement, and was meant and disbursed purely for campaign purposes, through the office of the then NSA and the SSS leadership at the time. He said that N60 billion that was okayed by the CBN on August 25, 2014 was said to have been shared between the two security agencies thus: N40B went to the NSA while N20 billion was released to the State Security Services (SSS). “While some of these newly emerging fund disbursements have been traced to the former NSA, there are indications that some of the funds are unconnected to the ongoing Defence contract trials of the former NSA, while some might,” he said. This new discovery is coming few days after Vice President Yemi Osinbajo described grand corruption as the elephant in the room when discussing the Nigerian economy. Recall that Osinbajo, in a recent speech, had alleged that weeks to the 2015 election under the administration of former president Goodluck Jonathan about N100B was released and embezzled. He also disclosed that about $289m was disbursed illegally about the same time. Details of the deal shows that documents including cash vouchers indicate that $289,202,382 was released in cash to the NIA by the Central Bank of Nigeria from the Joint Venture (JV) Cash Call Account No. 000-0000-11658-366 of the NNPC/NAPIMS with JP Morgan Chase Bank, New York, USA. At the exchange rate then of $199 to a naira, $289m was equivalent to about N60 billion. But had the money not been stolen, it would be at today’ s rate over N104B. According to the source, further findings showed that in yet another set of illegal fund withdrawals under one week between January 8 and 16, 2015, the sum of N1.5 billion was released in three tranches of N300m, N400m and N800m respectively. The source further said the sum was transferred to their various political associates, which included a former minister that is critical to President Muhammadu Buhari’s government. Further findings showed that N350 million was allegedly transferred to the former minister through his Zenith Bank Account No. 1004735721, on February 2, 2015. Also, another N250 million was allegedly transferred to him through the same Zenith Bank Account on February 19, 2015. According to Vanguard, a document further showed that yet another N10 billion was released to the Office of the National Security Adviser by the Central Bank of Nigeria (CBN) on September 15, 2015. An official source noted that even more illegal transactions would soon be unearthed.